The EcoFlo RO 2 & 3 Stage Reverse Osmosis System uses household water pressure to reverse a natural physical process called osmosis. Water, under pressure is forced through a semi-permeable membrane where minerals and impurities are screened out and sent down the drain with waste water. This reverse osmosis system connects to a house COLD water pipe for a water supply. 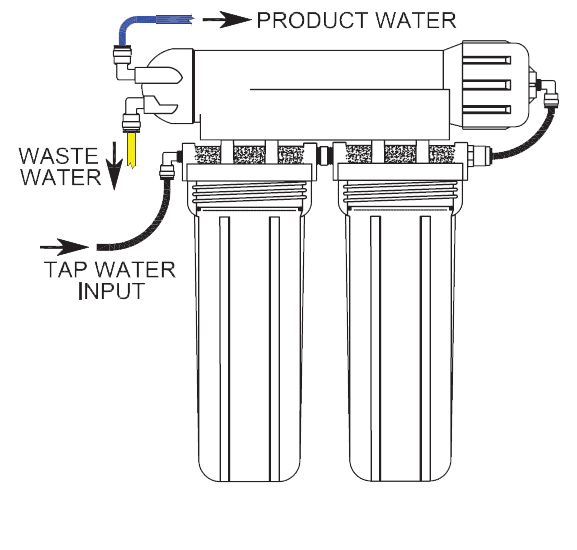 The system includes replaceable sediment/carbon pre-filters and a membrane. The sediment/carbon pre-filter removes sand, dirt, rust particles and other particulates as well as chlorine and organics. The EcoFlo Reverse Osmosis System gives you a continuous supply of sparkling clear, delicious water for drinking, cooking, hydroponics etc. Foods will look better and taste better too. Both models are available in 50 & 100 Gallons Per Day & include FREE SHIPPING! Osmosis is a process in nature that allows fluid of a lower concentration to pass through a semi-permeable membrane into a fluid of a higher concentration (See Figure 1). Because of the difference in salt concentration, pure water flows through the membrane as though a pressure were being applied to it (Figure 2). The effective driving force is called the osmotic pressure. As a rough guide, the osmotic pressure is equal to about 1 psi (pounds per square inch) per 100 ppm Total Dissolved Solids (TDS). When enough pressure is applied to the solution with a higher concentration it can then pass through the membrane into the solution of lower concentration. (See Figure 3). This is the basis of Reverse Osmosis. The incoming feed water from a cold supply pipe valve is directed through 1/4" WHITE tubing and is first passed through a sediment/carbon pre-filter. This filter is used to remove excessive turbidity, sand, dust, silt etc. that may cause the RO filter to plug up as well as organics and chlorine from the feed water that can damage the membrane. The final stage of the system is the R.O. membrane. A high rejection Thin Film Composite (TFC) membrane is used in this system. This removes as much as 98(+) % of most inorganic salts, all micro-organisms and almost all high molecular weight organics in the water.